The complex incorporated the latest "best environmental" practice techniques including energy efficiency. A contributing factor to the buildings performance is the high efficiency Ability Projects Ltd Matrix fan coil units, unique to the UK, that are installed to enable each A/C air duct to be balanced for air volume through fan speed alone. The fan coil units removed the need for costly and noisy volume control dampers as well as their time consuming installation. The fan coil units were supplied with Alerton BACnet MS/TP intelligent controllers that provided the user with wireless laptop access to all fan coil features and settings without the need to access the ceiling void. At the head-end there is Trend IQ3 BACnet/IP controllers and operator workstations running TOPS +963 software. To link the fan coil units to the central operator station, the BASrouter was used. The BASrouter routes messages between BACnet/IP and BACnet MS/TP networks as per the ANSI/ASHRAE 135 (ISO 16484-5) standard. 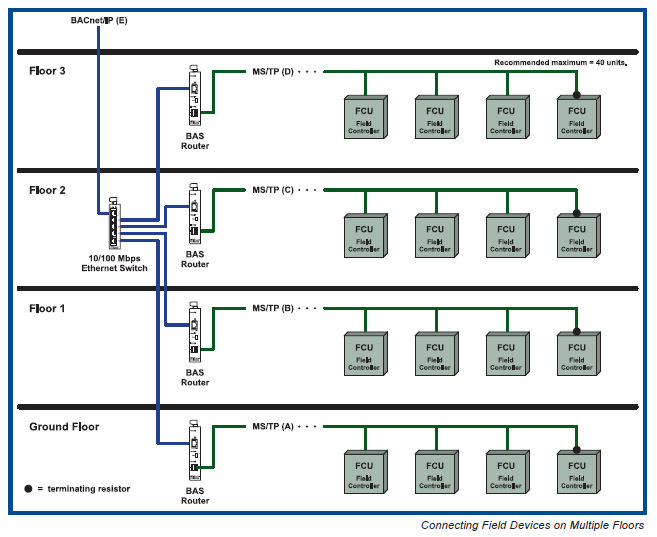 It allows BACnet/IP devices connected over Ethernet to communicate with MS/TP devices operating over EIA-485 twisted-pair wiring. The router mounts on 35-mm DIN-rail and is powered from a 24 VAC/VDC source. Each unit contains one MS/TP port and one 10/100 Mbps Ethernet port. The router is configurable via its webpage. Network addresses and MS/TP settings are made accordingly. In the control panel, a single BASrouter was positioned at one end of each MS/TP segment. All the fan coil units on that floor were then tied into the MS/TP port on the BASrouter using a bussed connection. Passive termination is applied to the last fan coil controller on the far end of the bus. The BASrouter located at the near end has built-in bias and termination. Although MS/TP allows for 4000' cable lengths at speeds up to 76.8 kbps, it was decided to restrict MS/TP segments to individual floors of the building to make wiring and troubleshooting simpler. The number of fan coil units per floor was artificially restricted to 40. On the Ethernet side, the BASrouter was connected to a 10/100 Mbps Ethernet switch. Because the BASrouter supports auto-negotiation and Auto-MDI/X, installation is easy. The BASrouter will negotiate its speed and duplex with the attached switch. The Auto-MDI/X feature allows for the use of either a straight-through or crossover CAT5 cable. One port on the switch was then connected to the main BACnet/IP network where the Trend building controllers and operator works stations reside. Using common BACnet discovery tools, each of the fan coils can be viewed from the head end. 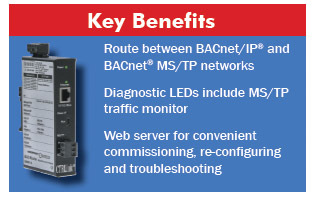 The BASrouter makes communication between BACnet/IP and BACnet MS/TP transparent. Lincoln Green BMS Ltd was the Nottingham, UK based system integrator on the project. They are an authorized Trend Technology Center (TTC). Click here to download this story as a PDF.